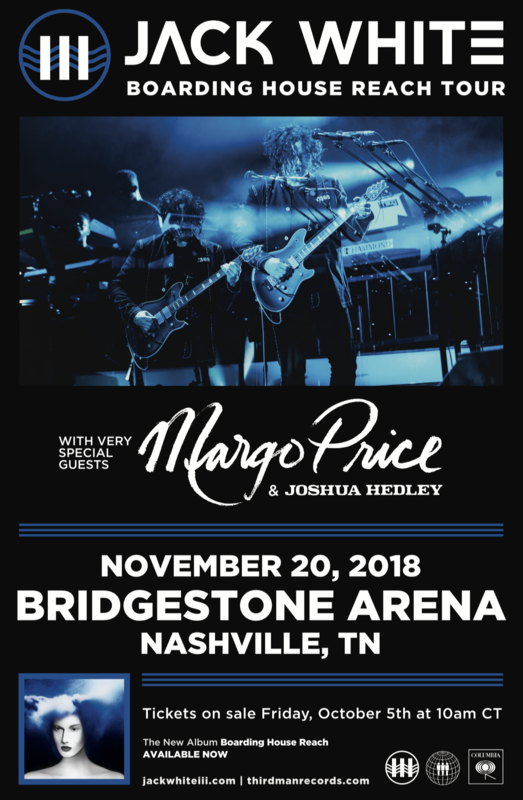 Jack White has announced a show at Nashville’s Bridgestone Arena on November 20, 2018 as a makeup show for Pilgrimage Music & Cultural Festival’s recent cancellation, ending the BOARDING HOUSE REACH world tour with a special hometown performance. The show will feature support from very special guests Margo Price and Joshua Hedley, rounding out the Third Man Records-centric bill. A limited amount of pre-sale tickets will be available to Third Man Vault members starting Wednesday, October 3rd at 10am CT. Tickets go on sale to the public at 10am CT on Friday, October 5th. Tickets will be available at livenation.com, the Bridgestone Arena Box Office or charge by phone at (800) 745-3000.